Having a tough time emotionally and not doing anything about it is the equivalent of having a tooth abscess in your mouth that’s causing a lot of pain. You hope it will die down. You don’t want the hassle or cost of going to the dentist and you might be scared of what could happen. So you carry on living with the pain. After a while you stop eating on that side of your mouth as it becomes too painful and this becomes the norm. Even though you are noticing that now the good side is starting to ache because it’s doing all the work. You take painkillers on a regular basis or the pain ruins your day and sleep. Then one day you wake up with a big swollen face. That abscess is saying ‘SORT IT OUT’. Do not ignore the problem anymore. So you go to the dentist and he can’t believe the size of the abscess and that you haven’t come sooner. Because this is what he deals with all the time and although it’s a bit tricky on the day, in no time at all the swelling has gone down and you can even eat on that side again. It was like that abscess never existed! And you really do kick yourself for not going sooner. You don’t need a problem to have a problem. What I mean by this is you can feel ‘out of sorts’, ‘confused’, worried or sad. Or suffer from anxiety or panic attacks, depression or stress. Or the problem presents itself in poor sleep. You might be clear on the symptoms, but not the cause. That is because the sub conscious mind has taken in a life event, it could be really small, and programmed it in a way that it effects behaviour and makes you feel bad. Some people know they are not ok. But they continue to struggle on.. Maybe the problem presents itself in behaviour like over eating, drinking regularly to ‘numb’ those feelings or spending money for a quick feel good. Only to find that all of these things soon wear off and the feelings are still there. Maybe you feel guilty for ‘over indulging in those feelings and that you should stop ‘being silly’. Or maybe you have found a way to avoid the problem? I’ve now treated two clients who drove everywhere without doing right hand turns because they were scared of turning right! 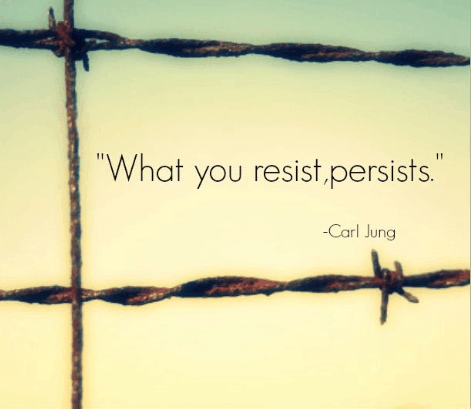 But what you will find is that what you resist, persists. It is the subconscious reminding you that something isn’t right and you need to sort it out. We shouldn’t underestimate the link between mental health and physical health. There have been numerous studies into the links between the two. What you may not realise if that when you are going through a traumatic time or feeling bad for no apparent reason, the difference getting therapy can make is unbelievable. You can feel better, gain strength and turn almost any situation into a learning experience. Once you learn to do this you will find curveballs that life throws at you easier to deal with. You will be more equipped to support others too. Review the postcard that you wrote to your younger self yesterday. What learnings can you see? Ouch I did have an abscess once – one of THE most painful experiences ever. And yes I ignored the pain for a while hoping it would go away on its own. It didn’t.